For this week’s Favorite Finds, I decided to do something a little different, that I have been getting a lot of questions about! A couple of weeks ago, I showed a little clip of our post Costco snack prep over on Instagram Stories. It is honestly such a life + time saver for us, I had to share how we do it + why it is one of my favorite mom hacks! Before we start any snack prep, we always take a trip to Costco. This is in NO WAY sponsored! It totally doesn’t have to be Costco, but them selling in bulk helps. And you guys, I just found out they DELIVER!!! Yes you read that right. Deliver to your door! Mom dreams coming true everywhere! haha! Insta-cart is actually the ones providing the service. You just go online and pick the items you need, and one of their shoppers goes and does it all for you. In my opinion it is completely worth it + your first time is FREE I’m not buying all the random things I see while I’m there that we don’t really need. Saving money + time, in addition my sanity?! Yes please! Plus, BONUS! If you use code KWRIGHT301A4, you can get $10 off + Free Delivery! Like I said, NOT SPONSORED, it is just been such a life saver I had to share! Back to snack prep!! In addition to the snack prep in the pantry, we’ve also started doing it in the fridge too. I saw my sweet friend Shannon from Clean Eats Clean Treats post a mouth watering picture of the genus idea, and I loved it! 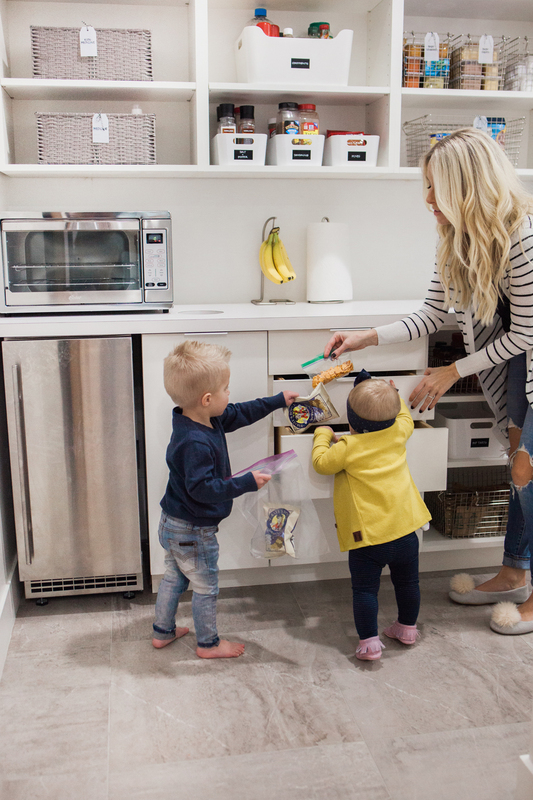 It is actually one of the main reasons we picked and love this fridge from Boulevard Home Furnishings (also where we got all our appliances + they are amazing to work with!) 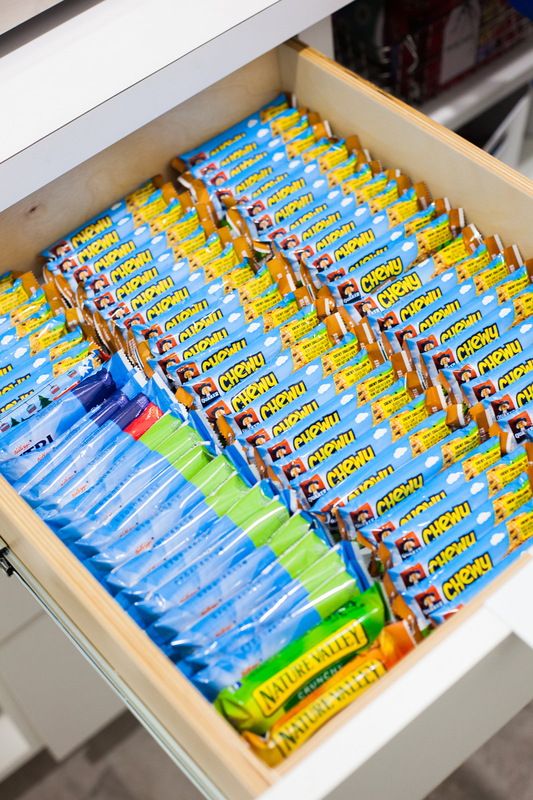 It has the perfect easy to access snack space! 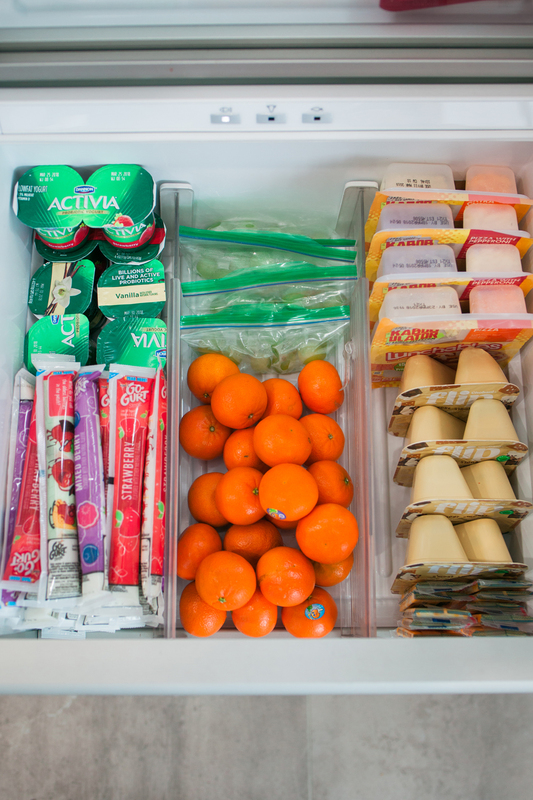 For fridge snacks we try to have string cheese, individually portioned fruits, yogurt, cuties, apple sauce, etc. It is really so simple, but has been such a game changer. I feel like my little people are so much more independent. If they need a snack, they know they can go grab one baggie. We especially love the system for being on the go. You can usually find us going from one sporting even to another after school, so my people know to just grab a couple baggies as they hop in the van. I even find myself using it on a regular basis too, so I don’t over snack. It is so nice to be able to grab a baggie of popcorn while I’m working…instead of the whole bag and eating way more than I meant to! That about sums up how snack prep at our house works! 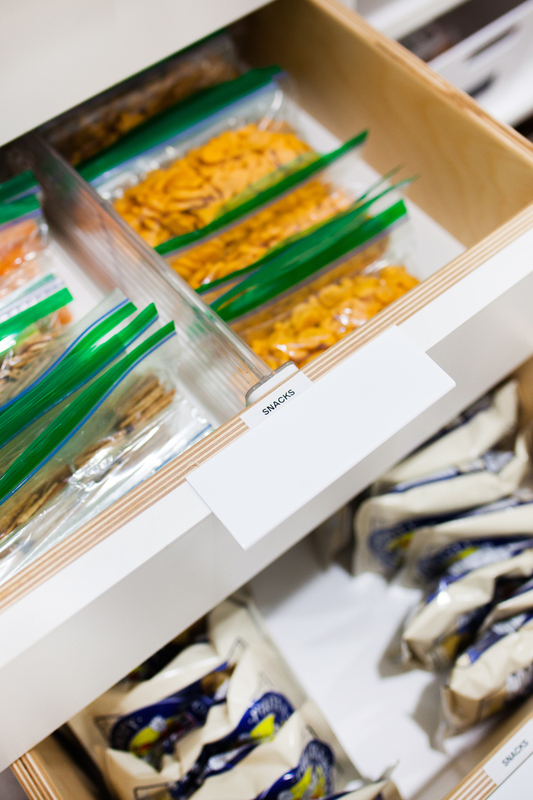 I’d love to hear any snack prep hacks you have too! Kailee, i love this! May i ask if you have any restrictions for snacking? I feel like my kids would eat 20 cheese sticks each if it was at their disposal. 😉 lol! 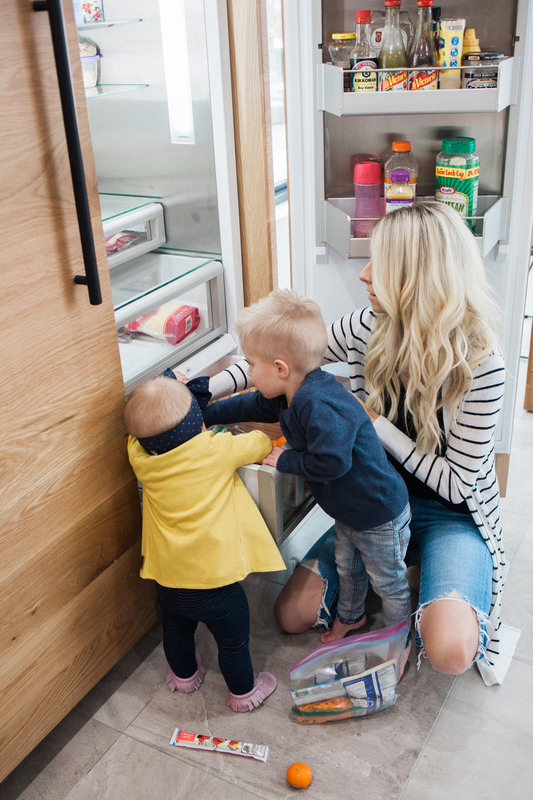 How do you control snacking, or is a free-for-all and you find that that just works for your family? Thanks for any thoughts on this! Hi Angie! We definitely have restrictions. We actually don’t usually do snacks after school, because dinner is always at 5. 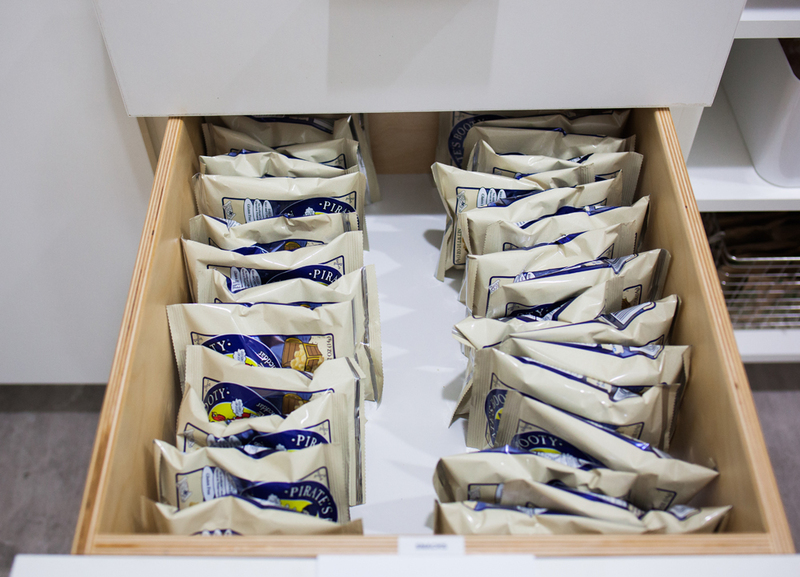 We use the snacks the most for on the go, and I usually specify how many baggies/options they can grab. It definitely depends on the sitution, but we try to set limits for sure! Which model is your fridge? It is the Thermador 24″ Built in Column. There is a fridge piece and a freezer piece that you order together. Hope that makes sense!